really annoying. My mom bought me a sulfur soap named Dr. Kaufmann for the remedy. Dr. Kaufmann is a soap that prevents or cure pimples, acnes and other types of skin disorders. It is good to know that there is an affordable soap that brings good benefit for your skin wellness. In my three weeks of using the soap, I saw my pimples slightly disappearing in my chest and upper back. I was consistent in using it for three weeks and glad that I did because the soap is really effective. However, I had some negative remarks about the soap particularly on the smell. also put moisturizer because this sulfur soap brings dryness after use. For the efficacy and affordability, I am giving this sulfur soap a two thumbs up but if you choose to use a soap that brings a refreshing smell for your body it’s not Dr. Kaufmann Sulfur Soap advisable for you to use. 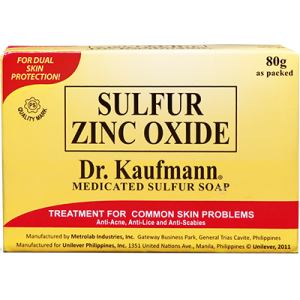 where can you buy Dr. Kaufmann Sulfur Soap? is it available here in the philippines? Yes, it is available in major supermarkets and drugstore in the country. Price is about Php70 ($ 1.65USD) per bar.